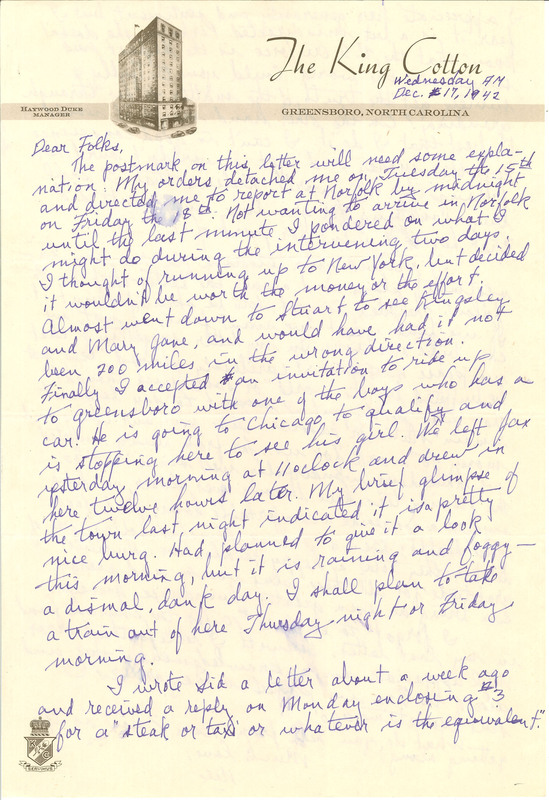 Wednesday AM Dec. 17, 1942 Dear Folks, The postmark on this letter will need some explanation. My orders detached me on Tuesday the 15th and directed me to report at Norfolk by midnight on Friday the 18th. Not wanting to arrive in Norfolk until the last minute I pondered on what I might do during the intervening two days. I thought of running up to New York, but decided it wouldn't be worth the money or the effort. Almost went down to Stuart to see Kingsley and Mary Jane, and would have had it not been 200 miles in the wrong direction. Finally I accepted an invitation to ride up to Greensboro with one of the boys who has a car. He is going to Chicago to qualify and is stopping here to see his girl. We left Jax yesterday morning at 11 oclock and drew in here twelve hours later. My brief glimpse of the town last night indicated it is a pretty nice burg. Had planned to give it a look this morning,but it is raining and foggy - a dismal, dank day. I shall plan to take a train out of here Thursday night or Friday morning. I wrote Sid a letter about a week ago and received a reply on Monday enclosing $3 for a "steak or taxi or whatever is the equivalent."